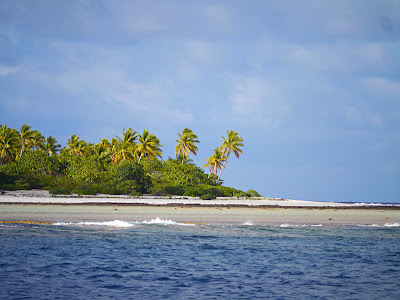 We are on passage from Palmerston Atoll in the Southern Cooks to Suwarrow Atoll in the Northern Cooks. 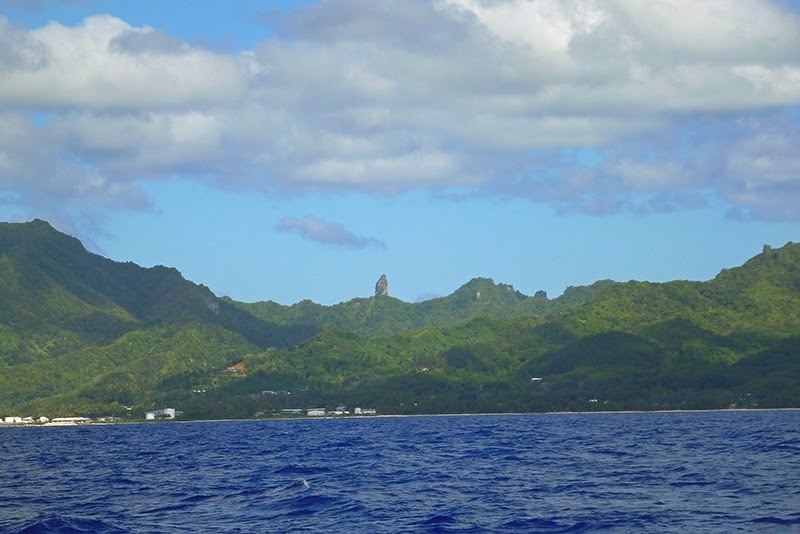 Thus far, our passages through the Cook Islands have been marked by the necessity of leaving an anchorage before it becomes untenable, rather than by an ideal (or at least a good) weather window for traveling to our next destination. We left Rarotonga just before northerly winds were about to turn the concrete sea wall at our stern into a dangerous lee shore. 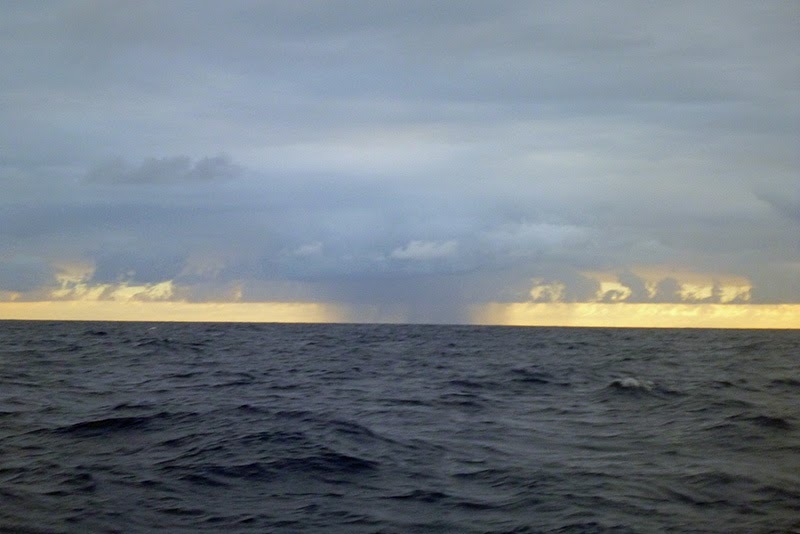 Our passage to Palmerston Atoll was a slow beat against northerlies, with some pounding in not-too-rough seas. 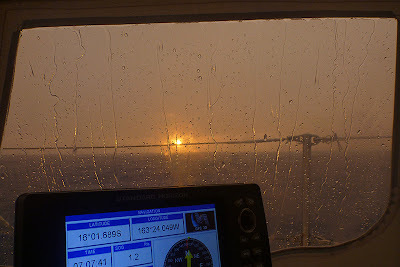 I woke one day to a squall line and we had a morning of heavy rain. Our average speed was only three to four knots during the first couple of days, as we logged one mediocre 80 or 90 nautical mile (nm)day after the other. 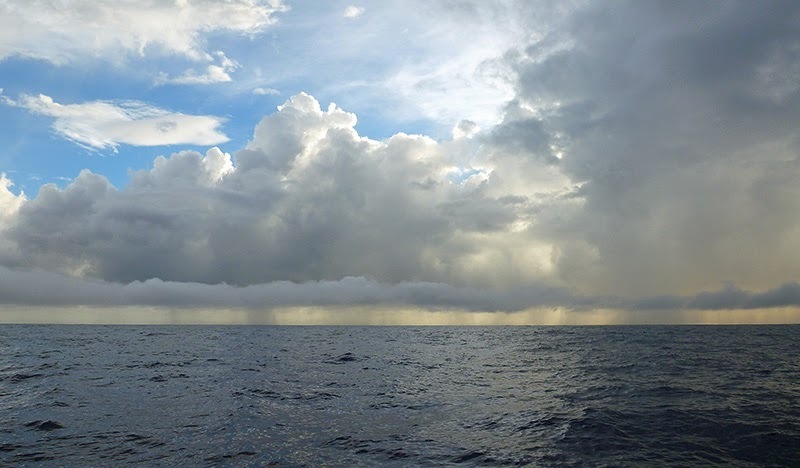 On the final day of the passage, the wind shifted to the south-southeast, and we flew along on a broad reach, covering the final 131 nm in one day. 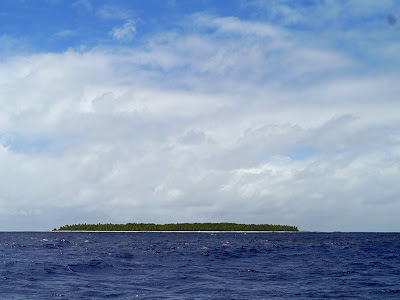 Now, as we leave Palmerston Atoll in our wake, a wind warning for the Southern Cooks tells of strong northwesterly to westerly winds: winds that would make the anchorage outside the reef at Palmerston Island not only untenable but potentially lethal. 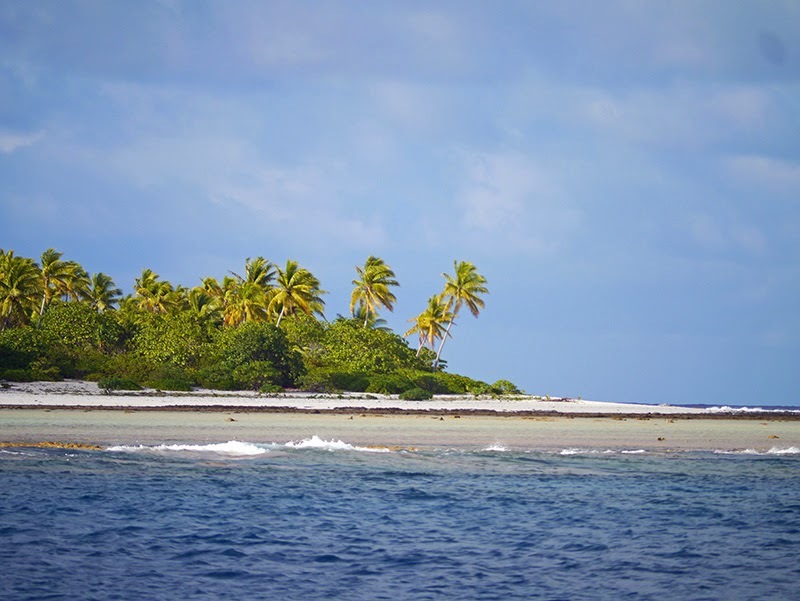 In an easterly flow, the anchorage off Palmerston Island is one of the most idyllic in the South Pacific. 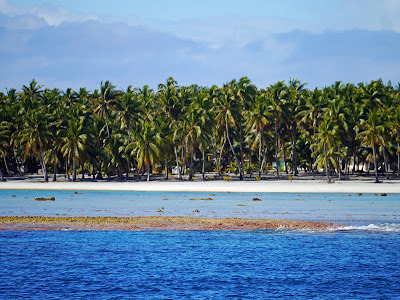 You rock on your mooring in view of a palm covered motu with a brilliant white coral beach. 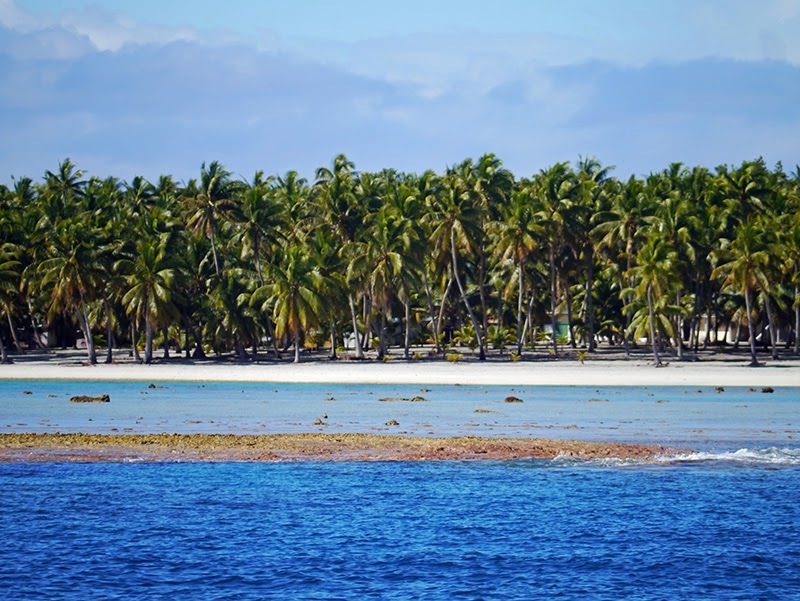 The motu is surrounded by a lagoon in dazzling shades of turquoise and jade through which dart parrotfish, a staple in the diet of Cook Islanders, in equally dazzling shades of teal, emerald, and violet. 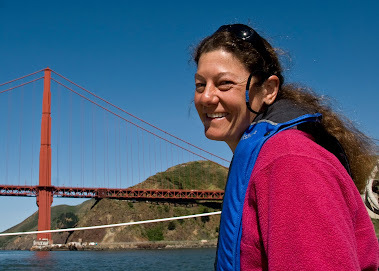 Dolphin, humpback whales, and sea turtles visit the anchorage, which is located outside the reef and the small boat passages into the lagoon. 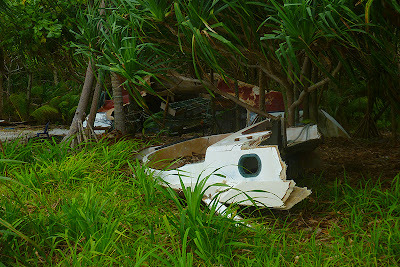 You are essentially moored at the edge of the sea, in the lee of a postcard-perfect tropical island. But when the wind shifts to the west, Palmerston's life-giving reef becomes a menacing lee shore. Indeed, a visit to the island is a sobering reminder of this fact, as one of the first things a visitor confronts upon landing is the husk of what was formerly the proud sailing yacht "Ri Ri" out of Philadelphia, PA, still exhibiting her patriotic colors of red, white, and blue. Ri Ri chafed through her mooring line in 2011 and was smashed on the reef. 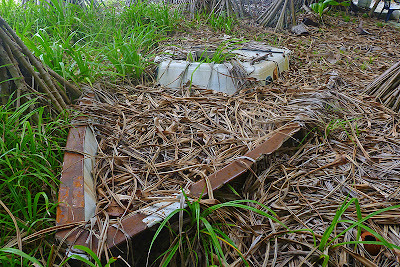 Parts of the shipwreck are scattered all over the island, but the remains of Ri Ri's hull---and one couple's American Dream---lie at the edge of the motu, where they were dragged ashore after being battered on the reef. A report from other cruisers who were in the anchorage at the time tells us that thankfully, the couple themselves escaped unharmed. (See Don Quixote's report on p. 47 in the Cook Islands Compendium.) 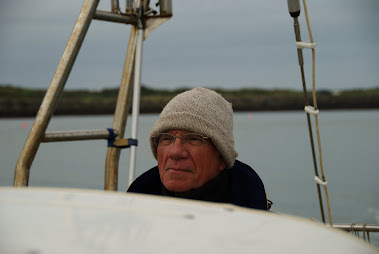 The same report stresses the wisdom of using two mooring lines to tie to a mooring (in Ri Ri's case it was the eye of the mooring that chafed through, not their single mooring line) and of adding a safety line below the eye using a rolling hitch. There have been other types of showers as well. 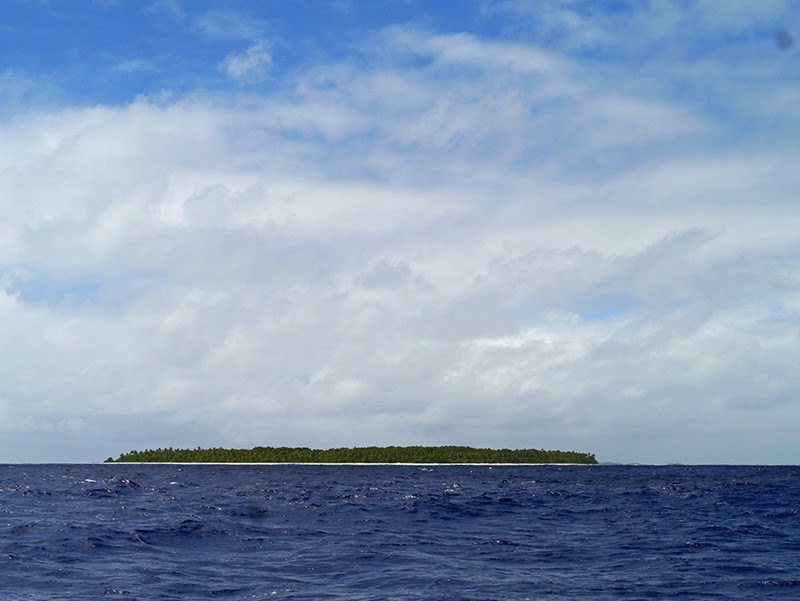 Yesterday, as I was typing up our experiences at Palmerston Atoll, a wave hit the boat and a cascade of water came through the partially dogged-down main hatch and landed on my laptop monitor and keyboard. At first, I just sat there stunned. No waves had so much as slapped the side of the boat in hours! A word of profanity may have escaped my mouth as I leapt up to get a dish towel. Meanwhile, Patrick grabbed the computer and turned it upside down to drain out the water. When he righted it, instead of the document that had been on my screen, all I saw were blocks of wavy white, lavender, and gray. 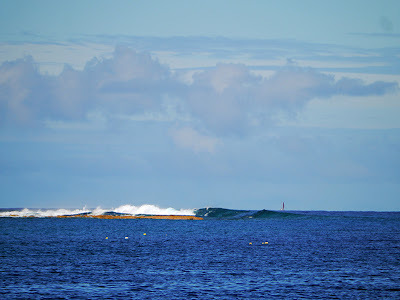 This was the work of one of those sneaky cross-swell waves that is bigger than all the rest! It does not look good for my monitor, but I am hoping against hope that the computer will restart after a thorough drying-out. Finally, we are clearly back in the tropics. 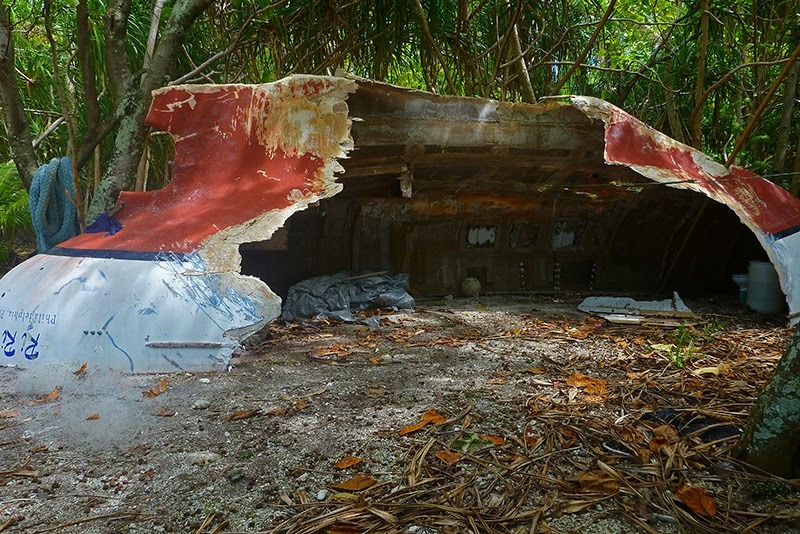 The hatch in the incident described above was partially open because the heat in the cabin is stifling. We live in a state of constant sweat and partial undress, and it is warm enough to take solar showers in the cockpit. Ahh, solar showers! How I've missed them!